On the St. Joseph side of the church (south wall) in the transept is a huge window depicting the story of the Descent of the Holy Ghost upon the Apostles. The main scene shows the Blessed Virgin and the twelve Apostles receiving a tongue of fire from the Holy Ghost represented above in the form of a dove. Seven small windows surround the dove and in each window an angel carries a scroll with the names of the seven gifts of the Holy Ghost: piety, fortitude, understanding, wisdom, counsel, knowledge and fear of the Lord. The next window represents Our Lord conferring the keys upon St. Peter. The sheep represent the flock entrusted to St. Peter’s care by the Good Shepherd. In the background across the water stands St. Peter’s Basilica, the Seven Hills of Rome and the glory of the Catholic world. In the following window is St. Peter preaching to the Jews in Jerusalem on the last day of Pentecost. The next window portrays the future St. Charles Borromeo receiving the cardinal’s hat from his uncle, Pope Pius IV. Next we find the scene depicting the baptism of Our Lord in the Jordan by St. John the Baptist. One part of the next window depicts a priest celebrating the Holy Sacrifice of the Mass. The other half represents the Cardinal, St. Charles Borromeo, giving First Holy Communion to another future saint, St. Aloysius Gonzaga. On the Blessed Mother side of the church (north wall) starting at the rear, the first window represents a Franciscan priest giving Holy Viaticum to a dying man. Near the bed, a nursing sister is pouring the oil into a dish in preparation for the administration of the anointing of the sick. Next is a window that depicts the engagement of the Blessed Virgin Mary and St. Joseph before the High Priest in the Temple. The first part of the next window represents the Holy Family; the second half portrays St. Angela Merici, the foundress of the Ursulines, instructing the little girls of the town on the basic principles of their faith. The following window represents the authority of Church and State, each supreme in its own field. The figures are probably Pope St. Leo III and the Emperor Charlemagne, crowned by the Pope on Christmas, 800 A.D. In the background are St. Peter’s Basilica and the medieval fortress. The next window represents monks in a monastery engaged in various works of art: one teaching music and singing, another painting, another sculpting a statue of the Madonna and Child, and another with a quill stooping to admire the painting of the Madonna and Child. In the rear of the church above the choir loft, we gaze upon one of the church’s most beautiful views, the large Rose Window. 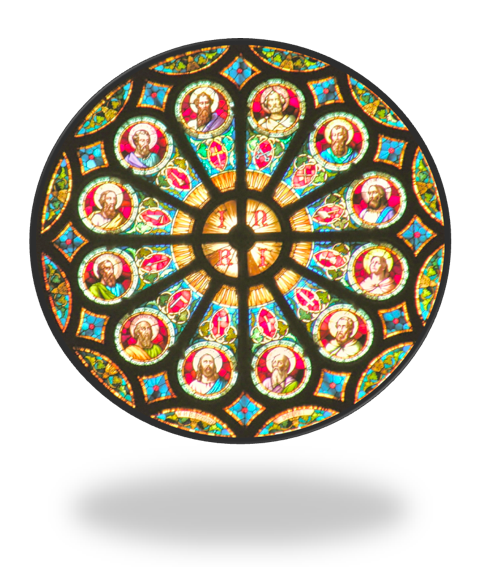 The letters “INRI” are in the center of the window, which means “Jesus of Nazareth, King of the Jews.” The heads of the twelve apostles are shown with a symbol of each by which known or the instrument of their martyrdom. Starting at the top and proceeding clockwise we see St. Peter (keys), St. Andrew (cross), St. James the Great (pilgrim’s staff and bottle), St. John (chalice), St. Phillip (cross), St. Bartholomew (knife), St. Matthew (axe), St. Thomas (carpenter’s square), St. James the Less (fuller’s club), St. Simon (saw), St. Jude Thaddeus (club) and St. Paul (sword). This Rose Window is one of the largest and most beautiful in the area. 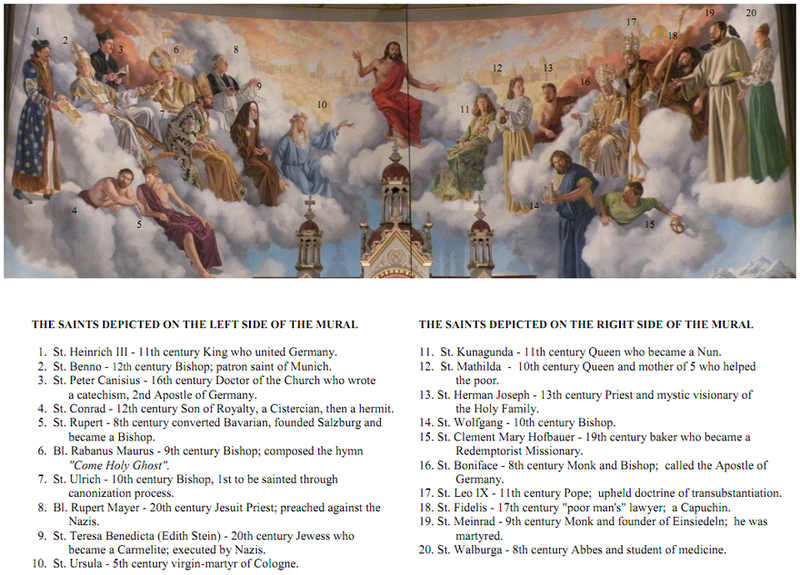 Below is the large mural located behind the main altar. These figures in the mural represent twenty Germanic saints and are numbered for purposes of identification. 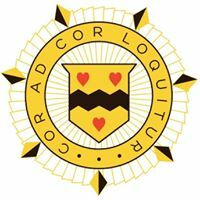 Four cardinal virtues: Prudence, Justice, Temperance and Fortitude. The two remaining murals above the arches on either side of the sanctuary represent eternal happiness (on the north side) and repentance (on the south side). The short invocations beneath each picture are each addressed to God the Holy Spirit (Geist).1. Geist der Seligkeit, Begluecke uns. – Spirit of HAPPINESS, fill us with delight. Boniface bringing the Gospel to the German people.2. Geist der Liebe, Entzuende uns. – Spirit of CHARITY, inflame us. Mother of the seven sons in the Book of Machabee.3. Geist der Hoffnung, Befestige uns. – Spirit of HOPE, fortify us. King David looking ahead with hope, on the star with the Christ Child.4. Geist der Glaubens, Belebe uns. – Spirit of FAITH, animate us. Abraham with monumental faith about to sacrifice Isaac. 5. Geist der Weisheit, Unterrichte uns. – Spirit of WISDOM, instruct us. St. Thomas Aquinas teaching dogmatic and moral theology.6. Geist der Verstandes, Erleuchte uns. – Spirit of UNDERSTANDING, illuminate us. St. Gertrude known for shedding light on mysteries of faith.7.Geist der Rates, Lenke uns. – Spirit of COUNSEL, direct us. Archangel Raphael guiding Tobias back to his blind father.8. Geist der Wissenschaft, Belehre uns. – Spirit of KNOWLEDGE, teach us. St. Catherine of Alexandria, philosopher and martyr.9. Geist der Staerke, Kraeftige uns. – Spirit of FORTITUDE, invigorate us. St. Stephen, King of Hungary.10. Geist der Froemmigkeit, Erfuelle uns. – Spirit of PIETY, fulfill us. St. Aloysius kneeling before the statue of the Madonna and Child.11. Geist der Gottesfurcht, Durchdringe uns. – Spirit of FEAR OF THE LORD, penetrate us. St. Jerome, as a hermit, struggling against temptation..
12. Geist der Starkmut, Ermuntere uns. – Spirit of FORTITUDE, rouse us. Jacob encountering an angel and the hero martyr, St. Paul.13. Geist der Maessigung, Beherrsche uns. – Sprit of TEMPERANCE, control us. Ruth, a model of obedience, abstinence and moderation.14. Geist der Gerechtigkeit, Beseele uns. – Spirit of JUSTCE, fill our souls. St. Michael holding the scales of justice and a sword to administer it.15. Geist der Reue, Erneure uns. – Spirit of REPENTANCE, renew us. The prodigal son returning contritely to his father.16. Geist der Klugheit, Fuehre uns. – Spirit of PRUDENCE, guide us. St. Joseph carefully leading Mary and Jesus on the road to Egypt.